Hand-block prints- the quilts of Sanganer, Bagru are the favorites. Tie and dye-Bandhej, Bandani, Lehriya, Batik, Mothra, Ekdali, Shikari, Cheent comes under this category. Bandhej- Bandhej of Jodhpur, Sikar, Jaisalmer, Barmer, Pali, Udaipur, Jaipur is more popular. The lehriya is a pattern in which an entire piece of cloth is dyed in different colours in the form of horizontal lines. Udaipurs lehriya work is well known. Samdar Lehar, Phagun are the designs to be worn in the spring season. Textile and fabric coloring and dying can be seen at length in the communities of Leelgarhs and Rangrez. The Chunari and Bandhej (the art of tying a small point on the cloth by threads and later dyed with the required colors is very popular. After drying when opened, there is a small circle in the white splashed around the fabric is known as tie and dye. Jodhpur, Jaipur, Bikaner are famous for this. In addition, the art of embellished fabrics with embroidery using thread-work, mirror work or gold brocade is prevalent. Block Printing in vegetable dyes is another famous art. In block printing, carved wooden blocks soaked in different colours are pasted on the fabric. The main markets of these products are Jaipur, Sanganer and Bagru. Zari - Gota, zardosi, banarsi for formal and bridal ensembles, metallic and threaded embroidery. The ability to cast a spell over you lies in the deft hands of the bandhani workers of Rajasthan. The secret lies in the unique process of sketching a design with red chalk or geru and then tying the cloth with thread or twine in to knots, which are sometimes as small as a pinhead. Each portion is then separately and uniformly colored. When the knots are untied, the glory of the pattern emerges. One of the most popular results of this process is the design known as the lehriya, which literally means waves of the sea that shimmers as the rippling waters of an ocean in bands of two, five (panchrangi) or seven (saptarangi) colors. Kotah produces a huge variety of designs rendered by this process, from geometrical patterns, flowers and creepers to animals, birds, kites and dolls in colors deliberately contrasted with the background color. A special form of bandhani work, which is highly valued for the delicacy and intricacy of its designs, is known as Chunari. The Sikari Bandhej, a form of the chunari, from Sikar in Shekhwat, is especially famed. The chunari technique is actually a combination of the tie and dye process and the direct printing process in which wooden blocks with nails are pressed on folded cloth to imprint the design and the raised portions are then tied with a string coated with a paste that resists dyes. The fabric is then dyed. When the knots are opened, the designs that spring to life can be simply magical. In Bhilwai, the untying reveals partridges, lizards, parrots and other birds and animals as well as other small motifs in shades of pink, yellow and green against a sober maroon or a bright red ground. In Baran, patterns are created with small triangles and squares as Tikunthi (groups of three), Chaubasi (groups of four) or Satbandi (groups of seven). Beldar patterns have flowing lines and Sikari patterns portray horses, tigers, elephants and human figures. Pomachi, an odhni or long scarf, is another favorite. In this, five large flowers form a pattern, ringed by a border in a contrasting shade. The dazzling combinations of colors include red with blue, yellow, green or pink. A special variant on the technique is do rookha dyeing in which two different colors are printed on the two sides of the cloth. Ajrakh prints from Barmer enchant you with bold geometrical designs on deep blue or blue and red on both sides of the cloth. The Chirkalibuti design is especially popular. Jaipur, Kotah, Chittorgarh and Kishengarh are also known for the Khari work on these prints, which involves layering on powdered gold or silver so that it creates an embossed affect. Udaipur, Barmer, Jaisalmer and Jodhpur are famous for the use of sandalwood paste along with the dye to impart fragrance to the fabric. The tie and dye process (bandhani): Unravel the knots of the process to find out how it casts a spell over you. The attractive colour combination of Chunari and Laharia is the miracle of Bandhej. This style of dying cloth, is probably as old as, the dress culture itself. According to imagination, marking points on the cloth, and on every point-tying knot with threads to dye the cloth, is the specialty of this style. In case of more than one color the process is repeated for every single colour. This process goes on from light colours to dark colour. This style is called the Bandhej, as for dying the cloth, first knots are tied on it with threads. Tying of knots and colour combination shows the skill of the craftsman. The centuries old tradition of printing clothes began with blocks of potato and developed into printing with wooden blocks. The blocks are carved on the specially evened teakwood. These lifeless blocks, when used with colors, print design on the cloth that looks full of life. For the combination of color in a design, different blocks are used. In block printing utmost care is to be taken, regarding applying even pressure on block every time, and properly matching the joints. Preparation of colors is an important aspect of the art of printing and therefore, according to the nature of the material used for preparing the colors, the printing techniques like Alijarin, Nandana, Bagru and Discharge print etc. were developed. In this process, the starch of the cloth is removed and the cloth is dyed in yellow, using Myrobak. Then for printing in black "Harakashish" and for printing in red alum is mixed with kachuka or gum pates in required the ratio and printing is done with blocks. In this style, which is liked by the tribals, the cloth is printed using alijarin method and the "Booties" are covered with specially prepared soil, called gara and the cloth is dyed with the peel of pomegranate. This most liked free hand style of colour craft probably came to India from Indonesia or China. Unlimited and creative imagination is the main feature of this style. That is the reason why sarees, bed sheets, dress materials, wall panels, portraits, etc. can be made by this method. Previously in this process specially prepared soil was used but in recent times hot melted wax is used to give shape to the imagination with the help of pen or brush for dying. In case of more than one colour the process is repeated for each colour. Lastly, the cloth is dipped into boiling water to remove the wax. This Technique of more production is less time consuming. It uses bright colors and is comparatively new. Many prints of the same design can be obtained using this technique. In fact screen is a mould made on a metal frame which can be used again and again. The bolting cloth is mounted on the metal frame and the photosensitive chemicals are applied on it to develop picture or design, similar to a photo film. For printing, the cloth is spread over a wax coated table to the full length. A separate screen is used for each color. The dhurrie, a simple rug that was once used as an underlay, has now become one of the states best-known weaving traditions. Weavers sit on looms in villages, creating an interesting blend of patterns- mostly geometric, sometimes floral- in an exciting combination of colors. Made from cotton yarn, in areas such as Bikaner and Jaisalmer. Woolen dhurries made from camel hair are also available in Rajasthan. 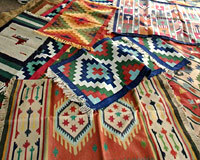 In areas around Tonk, namdahs or felted rugs are manufactured. Carpets first began to be manufactured in Rajasthan when weavers from Afghanistan were installed in the royal ateliers in the 17th century. Ever since, with their exuberant colours and geometric motifs, they are finding their way into showrooms around the world. Naturally they are available in the bazaars at a price far lower than they command in stores overseas. The Pabuji par is a long pigment-painted cloth which depicts the epic story associated with the legendary fourteenth-century Rajasthani figure of Pabuji. The epic of Pabuji is an oral epic recited in the Rajasthani language. The historical Pabuji was a medieval Rajput prince. He is now widely worshipped as a deity by Rabari herdsmen and others throughout the Rajasthan countryside. Also the low-caste Nayak priests serve him. Itinerant storytellers (bhopas) of the Nayak caste use pars throughout most of Rajasthan. The par is used as a backdrop for a night-time recitation of Pabujis heroic deeds. The par is stretched out in the open between two bamboo poles and the bhopa and his wife recite the epic story, accompanied by music from a stringed instrument called the ravanhattha. It is a very complicated story, with many plots and subplots, and it is actually impossible to tell the whole story in a single night. The audiences, who are devotees of Pabuji, are largely rural villagers. Members of the Joshi branch of the Chippa printing community make the Pabuji par clothes. The cotton fabric ground of the cloth is first prepared for decoration with rice starch and then burnished with a heavy stone. Gum-based gouache colours are painted on, starting with the lightest. Quite often the figures do not quite match the original outlines, but these will in any case be edged in black in a final stage in the process. Traditionally the Chippas are supposed to paint the eye of Pabuji in the last. Once this has been done, Pabuji is considered to reside in the par, which is then ready for ritual use. There is always a little box for written information, painted by Pabujis head. The painters name the place and date, the bhopas name and the price he paid for it are all put in. This can be wiped out if the par is sold to another bhopa. In the past, pars would end their days by being immersed in the holy lake of Pushkar, near Ajmer. 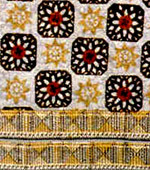 Other pigment-painted textiles are found in Rajasthan at Nathadwara. Known as pichhavai, these temple hangings are used by the Vallabhacharya sect and depict Lord Krishna, manifested as Shri Nathji. Perhaps the simplest form of textile structure found within the subcontinent is that of the split ply camel girths of Rajasthan. Worked by hand without a loom, these girths are stunningly simple, decorative and useful. The technique is also used to make camel necklaces and pot carriers. Until the advent of motor transport, life in the dramatic Thar Desert region of western Rajasthan would have been insupportable without the domesticated camel. The whole of the Thar Desert is the home to thousands of these animals and they are used to pull carts, to draw water from wells, to plough the sandy fields, and as riding mounts and pack animals. The men of the desert villages make the camels sturdy girths, sometimes out of cotton cord but more usually out of goat hair, using a unique technique. In his spare moments, the villager will take a bundle of specially prepared goat hair (either black or white) and with a simple spindle spin out the yarn. The yarn is doubled to make it two-ply. Four-ply yarn is required-for girth making, of which each ply is two-ply, and taking a length of two-ply yarn, folding it in four and then twisting it into a four-ply cord makes it strong.